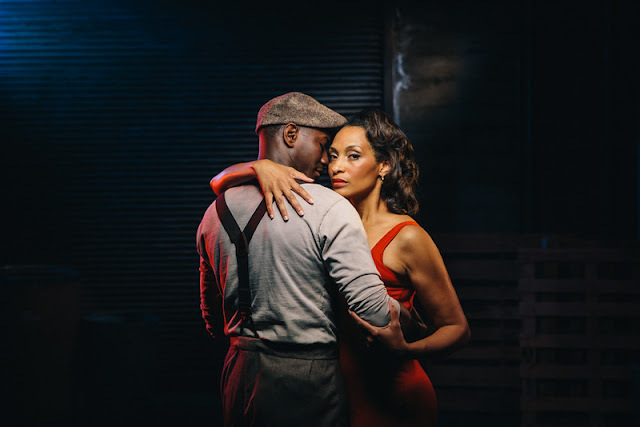 The mainstage season at McCaw Hall kicks off with a beloved American classic: The Gershwins' Porgy and Bess, Aug. 11-25. The show depicts the life, death, love and hope in a Black community in 1950s South Carolina. Photo by Philip Newton. A longtime trusted voice among Seattle Opera audiences, Melinda Bargreen has been writing about music for local and national publications for four decades; she is also a composer, and the author of 50 Years of Seattle Opera as well as Classical Seattle. Porgy and Bess is a marvel: an iconic, one-of-a-kind work of musical theater that still is commonly considered the greatest and most successful American opera. It’s also an opera full of ironies: a story about life in a hard-scrabble Black community in South Carolina, it was written and composed in the 1930s by three white men who had spent little or no time in that region. Its music, that rich and utterly singable collection of arias and ensembles, was the first and only opera composed by George Gershwin, a Jewish New Yorker who would die two years later at the age of 38. Critics have called the opera “arguably the most important piece of American music written in the 20th century,” and over the years its casts have drawn some of the world’s most distinguished African-American singers (an early international tour starred Leontyne Price with Cab Calloway). Along the way, though, Porgy and Bess has had its share of ups and downs: it has been shortened and altered, performed as a musical with a pit band and as an opera with an orchestra. During the Civil Rights era, the libretto and plot acquired uncomfortable overtones of “Uncle Tomism” for many, and Black singers became wary of taking on the roles because once they had sung in Porgy and Bess, they were more or less stuck in that repertoire. 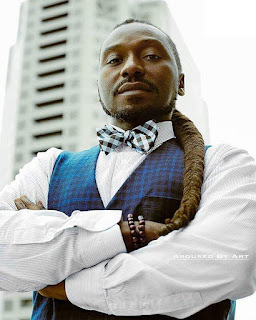 Now, however, opportunities for African American opera singers are considerably more numerous. 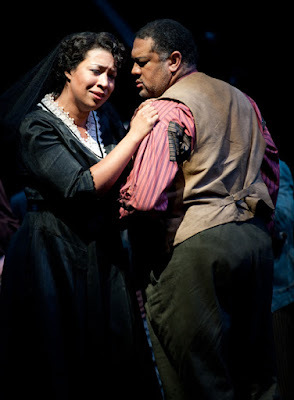 A great soprano like Angel Blue, who will sing Bess in Seattle Opera’s opening-night cast, is sought after in Europe as well as in the U.S., and is perhaps best known for two roles in La bohème (Mimi and Musetta). It doesn’t hurt that she’s very beautiful as well: Blue was “Miss Hollywood” of 2005. Last time she appeared at Seattle Opera in Porgy and Bess, it was as Clara (singing the show’s most famous aria, “Summertime”). Now she is back at McCaw Hall in the leading role of Bess, alternating with the British soprano Elizabeth Llewellyn, who has a major career in Europe with much heavier repertoire: Elsa in Wagner’s Lohengrin, and the title role in Puccini’s Tosca. Opposite Angel Blue in the role of Porgy is Alfred Walker, a powerful bass-baritone who made an unforgettable impression here in the 2014 Tales of Hoffmann (following his 2008 company debut as Orest in Elektra). Singing the four Hoffmann villains, Walker displayed not only his vocal heft, but also his considerable versatility; now, as Porgy, he will need to show a more vulnerable side. He alternates in the role with the equally versatile Kevin Short, whose repertoire extends from Monteverdi and Mozart to 20th century classics, and who has sung in major opera houses from New York and Chicago to Houston and Los Angeles. Mary Elizabeth Williams as Serena with Gordon Hawkins (Porgy) in Seattle Opera's 2011 production of Porgy and Bess. As the villainous Crown, Lester Lynch reprises a role he first sang for Seattle Opera in 1995 – 23 years ago. His repertoire extends well beyond Porgy and Bess to the title role in Verdi’s Rigoletto, and another epic evildoer, the wily Scarpia in Tosca. Jermaine Smith will sing a role with which he has been long associated: Sportin’ Life, whom he called “a bad guy but also a charmer” in a Chicago interview; Brandie Sutton, in her Seattle debut as Clara, will have a great opportunity to make her mark with “Summertime”; and Jake will be sung by Derrick Parker (he has sung Porgy at Chicago Lyric Opera to considerable acclaim, and is also acclaimed for Baroque repertoire performances). Jermaine Smith has performed the role of Sportin' Life more than 500 times in 15 productions.